Trumbull, CT – February 7, 2018 – TMC today announced that Hughes Network Systems, LLC (Hughes), a global leader in SD-WAN technology and services, has joined as a gold sponsor of the SD-WAN Conference & Expo being held February 14-16, 2018 in Fort Lauderdale, Florida. Bill Rumancik, Senior Director of Enterprise Solutions at Hughes, will be a speaker at the event, providing insights on how SD-WAN can transform an organization’s network capabilities for higher performance and efficiency. SD-WAN Expo is the leading event for enterprise executives, service providers, and technology vendors to learn about the latest network innovations and discuss how the market is growing and evolving. 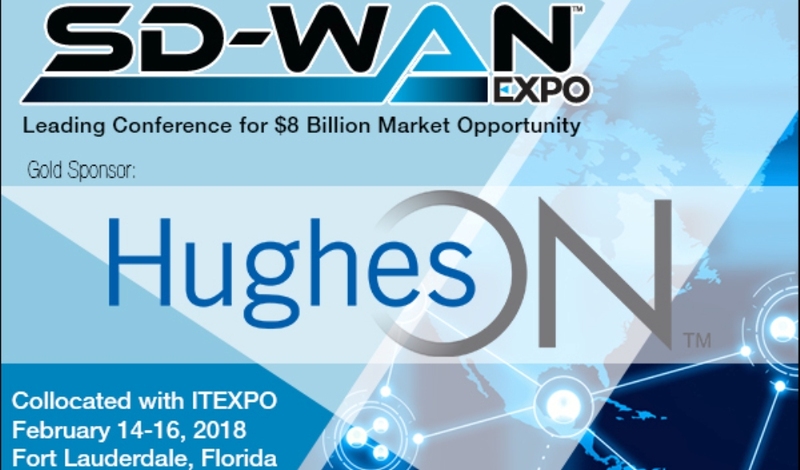 Running in tandem with ITEXPO – one of the largest communications and technology conferences in the world – SD-WAN Expo provides a unique forum for industry leaders to connect and learn how to make the most of the SD-WAN opportunity for their organization. Now the hottest networking technology in the market, SD-WAN is experiencing increased traction at organizations of all sizes and is projected to see continued significant growth for years to come. This growth is largely attributed to the deployment options that complement existing infrastructure, bring increased flexibility and agility to enterprise networks, and help organizations better manage their networks and resources. Expo attendees will have the opportunity to hear about practical deployment strategies and explore common challenges and future solutions from experts like Hughes and other participating vendors. Hughes will also be showcasing its newest platform, the HR4860, which combines industry leading Hughes ActiveTechnologies™ and UTM security features to deliver advanced SD-WAN capabilities. The new platform was developed in a partnership with cybersecurity solutions leader Fortinet. Registration for SD-WAN Expo is now open. Companies interested in exhibiting, sponsorship or advertising packages for SD-WAN Expo should contact TMC's Joe Fabiano at 203-852-6800 x132 or Maureen Gambino at 203-852-6800 x109. Hughes Network Systems, LLC (HUGHES) is the global leader in broadband satellite technology and services for home and office. Its flagship high-speed satellite Internet service is HughesNet®, the world’s largest satellite network with over 1 million residential and business customers across North America and Brazil. For large enterprises and governments, the company’s HughesON® managed network services provide complete connectivity solutions employing an optimized mix of satellite and terrestrial technologies. The JUPITER™ System is the world’s most widely deployed High-Throughput Satellite (HTS) platform, operating on more than 20 satellites by leading service providers, delivering a wide range of broadband enterprise, mobility and cellular backhaul applications. To date, Hughes has shipped more than 7 million terminals to customers in over 100 countries, representing approximately 50 percent market share, and its technology is powering broadband services to aircraft around the world.